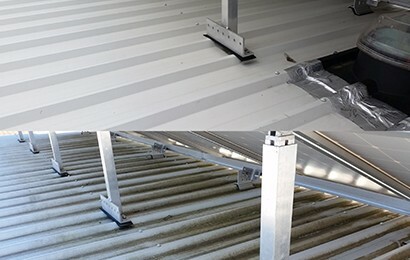 Ridge capping covers the ridge of the roof, or where two tiled roof surfaces meet. Ridge capping is necessary to seal the gap so the roof is watertight. The condition of the ridge capping will determine its functionality. Over time, the mortar bedding and flexible pointing (flexible cement type product) deteriorates, and can become loose, cracked and fall away. This leaves gaps in the roof where water can penetrate and will most likely result in costly water/moisture damage to the roof and ceilings below. Loose tiles can also become dislodged in heavy storms creating a much larger opening to the roof where the risk of damage is much higher. Ridge capping that is in poor condition with misaligned ridge caps and cracked mortar can also make the building look old and poorly maintained. We provide a 10 year guarantee for all ridge capping restoration work (re bedding and pointing). 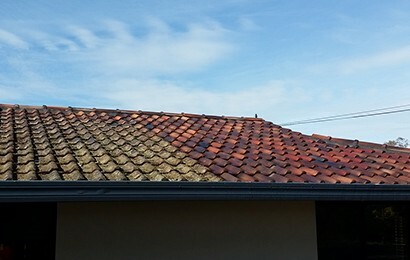 Tiled roofs are very durable roof covering but the effects of weather causes the mortar to eventually break down to a point that it becomes sandy and if left alone would be reduce to a crumbling mass. Fluctuating temperatures can cause the wood in the roof to expand and contract. These roof behavior can cause the mortar to crack and dissolve the bond between the tiles and the ridge capping. Other factors that causes movement can also affect the integrity of the roof. The weight of Tiled roofs also helps in causing the wood to sag and eventually break under heavy load. We will inspect the roof to ensure that all features are ok before conducting rebedding and pointing, and would replace any broken parts like battens and tiles on the roof. To prevent any potential disaster that can be cause by a loosed ridge cap. It is always better to get the maintenance done long before there is a risk of water build up to your home or building.